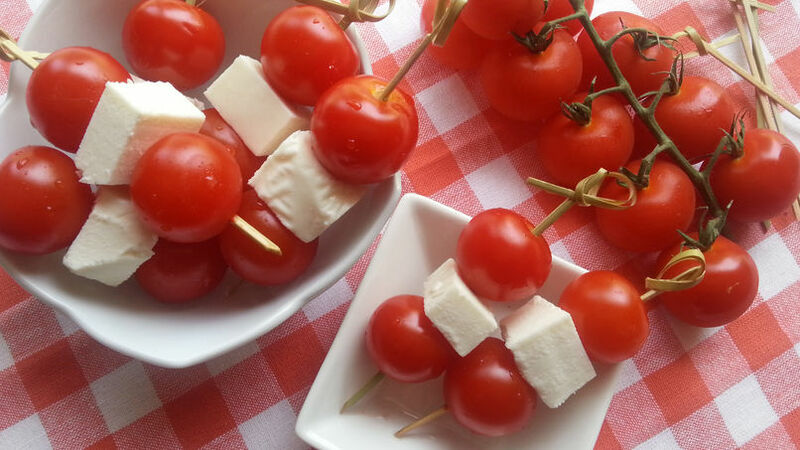 Wash the tomatoes and set aside, cut the cheese into cubes and put the kebabs together one at a time using bamboo skewers: First a tomato, then a cube of cheese and then another tomato. You can use gruyere cheese, mozzarella or cheddar. My family celebrates a lot of birthdays this month so having birthday recipes ready can help save us time when we're preparing food for so many people. I like using seasonal ingredients in easy and quick recipes to avoid complicating my life. I also like recruiting other people to help make these kebabs with tomato and cheese. They're colorful, fresh and easy to make. Enjoy!